I’ve been talking to Chuck a lot lately. While I used to be a happy Vanguard customer, that was back before their legal department attacked me for daring to give them free advertising. As I noted in that article, that would be the end of my relationship with Vanguard and the start of a new relationship with Schwab. Contrary to what I stated back in 2010, I did not end up transferring my Roth IRA immediately. Instead, I simply began new contributions to a Roth IRA at Charles Schwab. Why didn’t I make an immediate account transfer like I threatened to do? The only good answer I have is outright ignorance: I foolishly assumed that transferring to another brokerage would entail first selling all my Vanguard funds, which I had trouble stomaching since a couple of them were still in the red following the aftermath of The Great Recession. I was unaware until recently that one could transfer Vanguard funds to Schwab in kind without selling or eating a transfer/purchase fee. Schwab charges a fee if you purchase Vanguard funds within your Schwab account, but according to the CSR I spoke with, there is no fee for in-kind transfers. I should be able to confirm this within a few weeks. (Update: I can confirm that there was no fee for in-kind transfers, and moving the funds to Schwab took days, not weeks.) Once I found out this little nugget of information, I said adios to Vanguard and started the transfer process. So, for the last 2.5 years, all my assets at Vanguard have just been sitting there; I haven’t contributed a penny to my taxable or tax-advantaged accounts. While my anger at receiving threats from their legal department subsided pretty quickly, it still smoldered beneath the surface, usually bubbling up whenever I logged into their website to check a statement. Grrr. Within a few weeks, every penny will be hosted at Schwab. Admittedly, it took my brain a little time to get used to Schwab, but I chalk that up to never before having used a full-service brokerage. At Vanguard, all I ever did was buy from their family of mutual funds, regardless of whether they were in taxable or tax-advantaged accounts. At Schwab, you can choose from a veritable buffet of over 3,000 mutual funds alone, most of which you shouldn’t dream of buying. If you so desire, you can also trade individual stocks, options, and bonds (including municipal bonds and TIPS), trade a growing number of ETFs, and even purchase FDIC-insured CDs up to 30-years in duration! After my tiny brain finally overcame the initial shock of having so much choice, I quickly realized that my best bets focused on Schwab’s own family of mutual funds and ETFs. In my investment accounts, that’s all I presently own. At the least, you should narrow your mutual fund search to the OneSource Funds, as they have no loads or transaction fees. In a similar vein, all Schwab-branded ETFs trade without commission. One aspect about Schwab’s mutual funds that I particularly enjoy is that they only require $100 for the initial purchase (compared to $3,000 for many Vanguard funds). This makes them ideally suited to younger/newer investors. Subsequent purchases only require $1 minimum. Yes, I tried adding to a mutual fund with only $1, and yes, it worked. These two funds are a thing of beauty: They both track their corresponding index at near-parity to one another. Yes, there are two separate lines up above. This is exactly what index funds should do. Schwab’s index fund has a lower expense ratio, but Vanguard’s drops to 0.06 if you pony up over 10k and get Admiral shares. In ETF form, both SCHB and VTI share an incredibly low expense ratio of 0.06. I call this a wash. They’re both great funds with minuscule expense ratios. You could do a lot worse than either of these funds/ETFs. In this case, VGTSX has slightly outperformed Schwab’s offering, to which I give kudos. At least the two funds have stayed synchronous with one another over the hills and valleys. Both funds have nearly identical expense ratios: If you want to split hairs, SWISX has a slightly lower expense ratio, but if you can get to Admiral shares with Vanguard, the expense ratio drops to 0.18, splitting that hair even finer. It doesn’t get much closer than one one-hundredth of a point. We’re talking about ten cents for every $1,000 invested per year. Found any loose change lately? On the ETF side, we have VXUS (0.18) versus SCHF (0.13). Both have both performed equally (and equally poorly) since international equities have overall taken a beating in the last year or so. Whereas Vanguard gets a tiny nod for performance, Schwab gets a tiny nod for the lower expense ratio. Again, I call it a wash.
Finding a good total bond mutual fund has been the most disappointing part of my new relationship with Schwab. As you can see, something went horribly awry for SWLBX (orange line) in 2008. It would appear that the fund’s manager(s) overindulged at the sub-prime buffet and paid the price for it. Past performance does not indicate future results, so I hesitate to call it a horrible fund for new investors, but I would say that there are definitely better options out there. At least the fund only has a $100 minimum investment and recently lowered its expense ratio, though it’s still a little higher than VBMFX. I easily give the nod to Vanguard here. Though it’s not in the Schwab fund family, one good alternative total bond fund is the RidgeWorth Total Return Bond fund (SAMFX). As you can see in the above chart, it actually outperformed both Vanguard’s and Schwab’s family funds over the last decade. Schwab offers SAMFX without a load or transaction fee, and its expense ratio is still quite good, albeit slightly higher than the other two. I’m considering this one as a candidate for my primary bond fund. At least there’s good news for Schwab bond funds on the ETF side. The Schwab U.S. Aggregate Bond ETF (SCHZ) is the anti-SWLBX. This ETF made its debut in 2011, and here is how it has compared against the Vanguard Total Bond Market ETF (BND) since it debuted. Looks pretty good. Since its inception, SCHZ has slightly outperformed BND. Both have a low expense ratio of 0.10. I’ll basically call this a draw. I generally prefer mutual funds due to the ability to automatically invest money on a weekly/monthly basis, but I may end up with SCHZ as my primary bond fund. One final category of fund that I like to own is Treasury Inflation Protected Securites (TIPS). These are a type of treasury bond that, well, promise to protect against inflation. In this category we have VIPSX (0.20 expense ratio) versus SWRSX (0.29 expense ratio). As expected, the performance between the two funds is nearly identical, with Vanguard getting an ever-so-slight nod for both performance and expense ratio. Admiral shares at Vanguard will drop the expense ratio even lower to 0.11, but it will take you $50,000 before you reach those shares. On the ETF side, we only have the Schwab U.S. TIPS ETF (SCHP) with an expense ratio of 0.14. Vanguard does not directly offer a TIPS ETF, so if you’re an ETF nerd, Schwab gets the definitive nod here. I did not intend to write all of the above as a direct competition of Vanguard versus Schwab funds, though I suppose it was inevitable. My main point in pulling up all the fancy charts and rattling incoherently about expense ratios is simply to say that one can easily find comparable and competitive funds in both fund families. For someone like myself, who used to have a Vanguard-or-nothing mentality, I’ve settled in quite comfortably with my Schwab account. In many ways, this is the perfect checking account. My favorite part is the unlimited ATM rebates, even at foreign ATMs. This makes it an incredible account to use when traveling abroad, especially when coupled with a Capital One credit card for purchases (0% foreign transaction fee). Since I occasionally go on random trips to Greece, paying zero foreign fees is fine by me. I also enjoy the postage-paid deposit envelopes. Need to deposit a check? 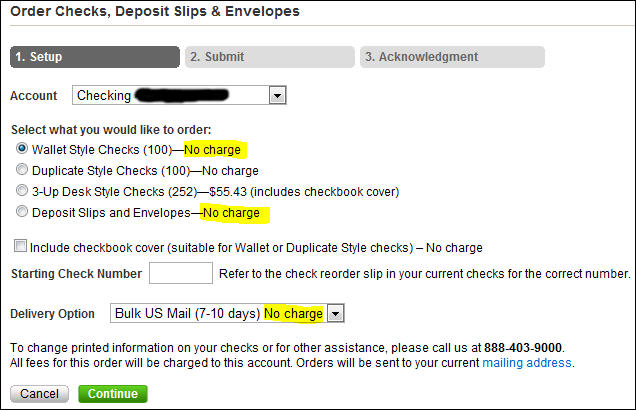 Just complete the deposit slip and drop it in the mail – no stamp necessary. Schwab will e-mail you when they receive it. Easy as pie. Oh, and did I mention the free checks? In fact, the only beef I have with this checking account is the name. It’s called High Yield, but as of July 2012, it only yields 0.15% APY. Oh well, it seems that nowhere is high-yield these days. I still plan to keep my Alliant Credit Union account, but for someone who just wants one simple login to manage both banking and investing, Schwab is a good one-stop shop. They do offer a so-called High Yield Savings account, but it yields about the same as their checking. If they offered a competitive savings account, I would consider making Schwab my complete home base. I called this a mini-review. Well, maybe it is, as there’s much I have not discussed, such as transfer times to external accounts (fast) and setting up an Automatic Investment Plan (easy). I also appreciate how quickly I’ve been able to reach a person the couple of times that I’ve called them. Overall, I’m pretty happy with the investment options and I’m growing to love Schwab Bank. That said, the last thing I want is for this post to read like an advertisement – no one asked me to write this and I received no compensation from Schwab for doing so. Heck, I didn’t even bother to link to their website anywhere in this post. In the days when rates were higher, I used to chase rates. When a better rate was offered, I’d drain all but $1 in the account and move elsewhere. This left me with husks of accounts all over the place. The best endorsement I can give is that since opening my Schwab account in 2010, I have gradually consolidated my money down to two locations: Schwab and Alliant CU. My wife is much happier with this setup, because if I got hit by a bus tomorrow, she wouldn’t have to hunt down our resources all over the Internet. But Chuck, I’m warning you: While you have my loyalty for now, it’s not blind loyalty. 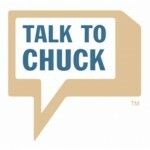 If you triple your fund expense ratios, or if you dare threaten to sue me for using that talk to Chuck logo at the top of this post, our relationship is over!